I help individuals and teams thrive in the midst of challenging and stressful work environments. Veterinarians, animal shelter workers, lab animal research workers, animal advocates and people in “helping” vocations are called by a deep desire to serve others. This also puts them in the line of fire to directly witness the suffering of others, profoundly affecting them and their ability to serve. Left untreated, this “cost of caring” (Figley, 1982) – known as compassion fatigue — is an occupational hazard that can permeate the entire veterinary practice, organization and of course the individual. The commonly accepted resignation and silent suffering of these professionals has widespread impact. The professional, organization and the quality of care are all negatively affected. There are steps to better manage compassion fatigue and minimize its impact. Rekindle enhances the wellbeing of the individual and the organization and as a result, the care your organization delivers. I help veterinary professionals and other animal workers regain the passion that originally drew them to their vocation and arm them with tools to maintain it. The impact on animal workers can be devastating, with far-reaching implications for everyone. The widespread symptoms affect all aspects of ones life, making it harder and harder to function at their highest level. Impacting the teams they work with and the quality of care that’s delivered, compassion fatigue can ultimately end the veterinary professional’s career and shortchange your organization of the skills and expertise they possess. I provide veterinary professionals and other animal workers with tools that can combat this cycle, enabling them to provide quality care without suffering negative consequences. I give hope for a lasting and sustaining career. 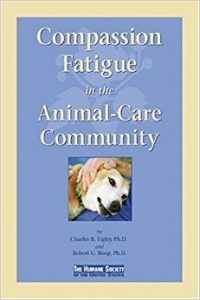 FREE copy of “Compassion Fatigue in the Animal-Care Community” by Charles R. Figley Ph.D. and Robert G. Roop Ph.D.